Following the installation of Bühler’s fully integrated optical sorting station, which included three SORTEX optical sorters, Poly Recycling GmbH confirmed that they achieved a full return on investment (ROI) in just six months. The optical sorting station, said to be the first of its kind in the industry, integrates separation and sorting steps in the processing line, including plant engineering, sorting technology, mechanical separation machinery, pneumatic conveyors, pre-conditioners and auxiliary equipment. The installation allows Poly Recycling to sort a wide range of polymer, color and polyethylene terephthalate (PET) products, as well as creating plastics flakes of higher quality. Recycling processors are increasingly required to remove unwanted polymers together with unwanted colors and foreign materials, including flakes coated with glue or adhesives, loose paper labels, aluminum and ferrous metals, according to Bühler. The company also enables multi-national food and beverage companies to meet the demands of the food industry for high quality food grade recycled PET (rPET) products and increasing the use of recycled materials in plastic packaging. able to overcome the issue of polyvinyl chloride (PVC) contamination from labels on rPET bottles using newly developed PVC Label Reductions Kits. 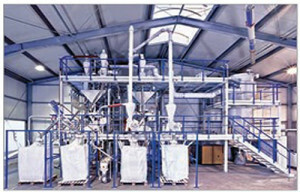 Previously used to produce food packaging and beverage bottles, cosmetics products packaging, as well as films, containers and strapping, the use of Poly Recycling’s plastic flakes has now been extended to the clothing and automotive industries, where the product is used in the production of airbags, seat belts, insulation mats and air filters. “Since the installation, we’ve been working closely with a number of leading plastic processors across Europe to install our optical sorting station and look forward to extending our solutions further to the wider plastics recycling sector,” said Bernhard Gabauer, Segment Development Manager for Plastics at Bühler.